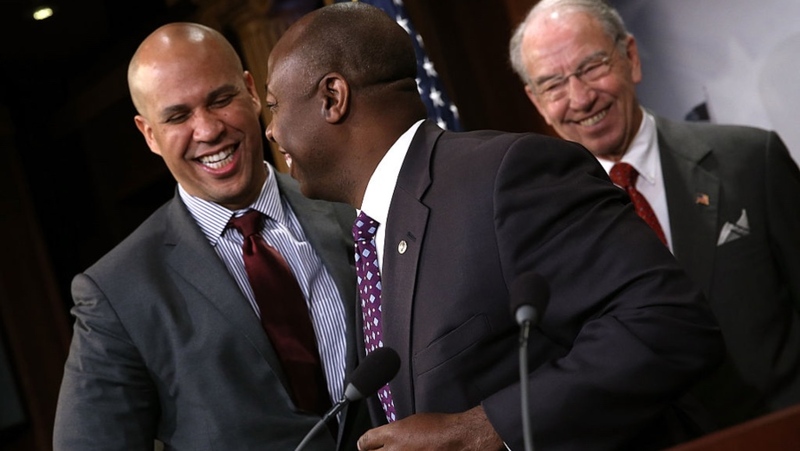 Sen. Cory Booker (D-NJ) and Sen. Tim Scott (R-SC ) led the passing of a bill this week to address sickle cell anemia, a disease which disproportionally impacts the Black community and yet, receives notably less funding for research. The bipartisan bill passed on Tuesday and will be signed into law by President Donald Trump. Ninety percent of those who are diagnosed with sickle cell are African-American. Sickle cell anemia is group of blood disorders which cause infections, pain and fatigue, making everyday life difficult, and can shorten patients’ life spans by 20 to 30 years. “Even though sickle cell disease is the most common inherited blood disorder in our country, research and treatment lags behind that of other chronic illnesses,” said Sen. Cory Booker in a statement. One of the most well-known champions of sickle cell is singer, T-Boz, who penned an exclusive op-ed for theGrio earlier this year about her journey with the illness. “My symptoms popped up whether I was performing on stage or just trying to take care of everyday things like going to the store or taking my children to school,” writes T-Boz. The new sickle cell bill will issue funding to health departments at national and local levels in order to collect more data for studies on the disease and “improve access to screening, treatment, and management” for those living with the disease and who continue to be at risk. According to the CDC, sickle cell impacts an estimated 100,000 Americans and millions throughout the world, particularly with ancestry in sub-Saharan Africa, the Mediterranean, India and other parts of the world. Today is #RareDiseaseDay, which aims to raise awareness of rare diseases and their impact on the lives of patients. As part of this initiative, I’m hosting a roundtable right now in my office to talk about sickle cell disease, and discuss my new bill, The Sickle Cell Disease Research, Surveillance, Prevention, and Treatment Act. Joining me are some incredible people including sickle cell disease representatives, medical professionals, patient advocates, and patients. Most people don’t know that sickle cell disease is the most common inherited blood disorder and the most common genetic disorder in the US. The disease is estimated to affect as many as 100,000 Americans with as many as 3 million Americans who hold the sickle cell trait. Sickle cell disease disproportionately impacts Black and Latino populations—in fact, an estimated 90 percent of Americans with sickle cell disease are Black. More than 75 percent of adults with sickle cell disease with frequent pain do not receive their recommended treatments which is a shocking reality that demands we do more to fix this public health crisis. My bill with Senator Tim Scott would accomplish two main objectives: Reauthorize the Sickle Cell Disease Treatment Demonstration Program; and create a new grant program to support sickle cell disease research and data collection. We need to start treating sickle cell disease for what it is: a public health crisis that demands our national attention.